Loophole Cinema worked with site-specific live actions where the audience and the site constituted a part of the film event. Greg Pope has continued to work in the same tradition. Bea Haut is well-known for her intense performative short films that explore the filmic space as place and time event, while Karel Doing’s work ranges from abstract aesthetics to poetic documentaries. AVANT 28–29 September. Kristinehamn Art Museum; Cinema Arenan, Karlstad. 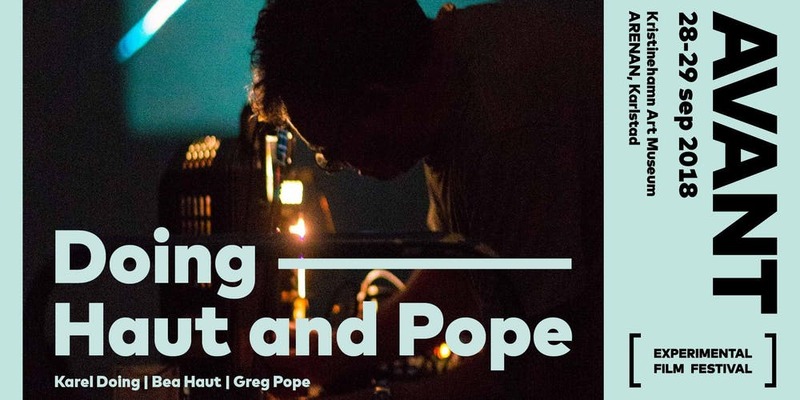 Artist talk with Doing, Haut and Pope. The film discussions take on a looser form as the visiting artists and audience move to Slussen for food and drinks. Restaurant Slussen is at Kungsgatan 6, Karlstad. The dinner is 150 kr. The screenings at AVANT is free of charge but you need to book in advance to be sure to get a seat. Register here. There is a limited number of tickets. For information and inquiries: [email protected]. AVANT has been organized since 2002 and the 15th edition is a collaboration between Världsalltet, Kristinehamn Art Museum, Karlstad and Stockholm University. AVANT18 is sponsored by Karlstad Municipality, Kristinehamn Art Museum, Region Värmland and Stockholm University.